Flying with a toddler soon? What about that carseat? Do you check it or bring it on the plane? These are some questions every parent asks when flying with a toddler. This topic has come up a couple of times to me recently so I really wanted to explore it further. To clarify further, today we are discussing options for a toddler (2 years +) that you have to buy an airplane seat for, regardless if you want a carseat or not. So what really are the pros and cons? In my experience, we have flown with a toddler carseat for our 2 year old so she would sleep during her naptime. She was the type who would only sleep when left alone and it worked like a charm. I personally found it difficult to get the seat on/off the plane because of the small aisles, and in addition to the other carry-on bags. Our carseat also didn’t allow us to use the seat table in front of my child because the carseat made her lap too high. The next problem came when connecting to a next flight. I found it difficult to transport everything to the next gate. Once, traveling by myself with an infant and a toddler, I had a stroller, infant carseat, and a toddler booster plus a carry on bag…way too much stuff! Every time after that flight, we really preferred to check the carseat and found it much easier. You have the access to the table, and your toddler has a little freedom. Granted that comes with a slightly bouncy child, but make sure you pack some fun things to do! If traveling for an extremely long flight however, I might reconsider bringing the carseat so a toddler could sleep. It is interesting to note that on our overnight flight back from Kauai, I did not see any families with carseats. Carseats must have “Airplane approved” on the side. 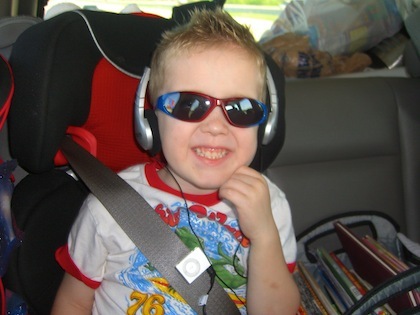 The FAA does not allow booster seats with no approval label or no shoulder harness. Make sure you know your airline’s policy, especially if you are traveling overseas and using partner airlines. International airlines in particular have special regulations for carseats. 1. Try an airplane restraint system. One example is CARES Child Aviation Restraint System, a harness approved by the FAA for toddlers 22-44 pounds. Keep in mind that because the CARES system is the only system approved, you will not be allowed to use other kinds during taxi, take-off, and landing. They are however, welcomed in the air. 3. Use a travel cart you can strap the carseat to, like the Britax Car Seat Travel Cart for connecting flights and transport in the airport. 4. Buy or borrow a carseat that is approved for the plane and either has an attachment for a snack table, or is low enough to allow the tray table to come down. One example is the Radian RXT. This carseat folds and has a lower profile. User reviews say they love using them on the plane, but it is very heavy. Please share if you’ve used a carseat on the plane for a toddler or decided against it. Hot topic to learn about! Make sure you also take our poll on facebook. Thank you! We used to always travel with a car seat on the plane…more for my state of mind than anything. Yes, it was a huge pain dragging it through the terminal, getting down the aisle, strapping it in, etc. But, when our daughter was younger (18 mths-2 yrs), I am glad we hauled it around. We did not bring it on the plane this last trip with her (4 yrs old) and so glad we passed. We try to travel with as little as possible so if we’re going to see family we borrow car seats when we get there and if we’re going somewhere else we check them. We also ship our luggage so we don’t have to worry about the hassle of getting the kids and all the luggage on the plane. Thank you for your comments ladies! Each of you had something different to share that really added to this post. I really appreciate you taking the time. Did you use an infant car seat ever or one rear facing. I am wondering about if the person in front can still put their seat back and how to deal with that? I am traveling overseas with a toddler and infant and we are buying a seat for both. I have traveled many times with the two year old before and I know how difficult it is to get her to stay in control and seated with the seatbelt on the plane (she can slide right out and even knows how to open it! )– and by the end of my 3 hour flights I was done- so international travel without a seat seems like it would be unbearable. I am trying to find a way to have some sort of portable tray for the toddler though. Looking on Amazon… will update if I find something. One note- Our toddler carseat is the combi coccoro which I a bought specifically because I knew we would be doing heavy airplane traveling in our parenting lives. It is lightweight and slender so I hope it will do well- I haven’t yet traveled with it on an airplane though. I believe we used a Graco forward facing carseat around that time and used it for the airplane travel. It was smaller in size than the Britax and fit better in the airplane seat. You might have to check general airplane seat diminsions. My guess is that the person in front of you will be fine. You might have to move your shade to the foot of your rear facing seat and see if your handle can go in that direction. If so, it should be fine. Those seats don’t recline that far, or at least don’t seem to. Good Luck on your international travels! Thanks for the tips Heather about the combi–I’d love to hear a follow up on that. I agree with what Amanda said about the seats. We originally traveled with a Graco snugride for our infant, rear facing, and I remember it being snug, but working. I have an upcoming post about making sure your carseat will fit. Another option is to book the bulkhead seats. The carseat will for sure fit, your toddler won’t be kicking the seat in front of you, and you’ll have a little extra room to maneuver with two little ones in tow. Some international flights even have a cool bassinet they can hook in the bulkhead space! Just thought I would add an update since we did travel with two carseats on an international flight. I think the car seat was a life savor. My toddler could actually fall asleep and that made all the difference in the world. And she was also able to see out the window better and reach the TV in the seat in front. Kicking the seat in front was still an issue, but it always is. When it was “night time” we put her in her seat and we strapped the car seat and told her it was her bed. We tucked a blanket around her and she was able to fall asleep. We had her by the window so she was able to sleep undisturbed for quite a while. The person in front of the infant carseat was still able to put their seat back but I am not sure if this would be the case for all flights. We rode coach on American Airlines I believe. We bought two in front and two in back so we could put the toddler in front of the carseat if needed, so we were the only one inconvenienced. It wasn’t an issue though. Obviously for my infant, the carseat was ideal for her sleeping undisturbed as well. Forgot to mention the tray could not go down, but she just colored on a book as a hard surface and it was that big of a deal. I think it would be more of an issue now since she is almost 3 so we might not take it next time, but I am still debating since she slept soooo well with it! Thank you so much for these updates Heather. Really good first hand experience. Actually Laura has a good option on here for a tray- the star kids snack and play travel tray. Yes, I like it because of the pockets and strap that can go behind the carseat so it stays up. Here’s a tip for traveling with kids. Audiobooks and lots of them! You can fill up your iPod at lots of sites, but we found one where you an download original children’s stories for free. Original is the key word here. How many times can I possible listen to Little Red Riding Hood?! Anyway, here’s the link if anyone is interested. http://www.twirlygirlshop.com/stories-for-kids. Also, chewing gum! Hope this helps. We love audiobooks! Isn’t it fantastic the cool stories you can find? I hadn’t heard of twirlygirl stories. Thanks for sharing that! Glad it was helpful. I’d love to hear how the bassinet and carseat works out for you. Hope you have a smooth flight! Thanks for this post about airline travel with toddlers. I will be traveling alone with my 20-month-old soon and am seriously considering purchasing the Diono Radian RXT for both safety and the possibility of sleep (hers). My husband and I have traveled with her many times, always on our lap, and she never sleeps on a plane. My upcoming solo trip will involve a 3 hour flight, 3 hour layover, and another 2.5 hour flight (unfortunately, there are no direct flights) . So, I’ve been doing a lot of research and trying to evaluate the cost of getting through security, lugging it around the airport, and installing/de-installing on two different flights vs. no naps/sleep for 10 hours. If you have any advice or recommendations about this I’d be very grateful. Also, can’t get her to wear headphones (she rips them off) so I’m not sure how to take advantage of video/audio activities (the flight attendants always make us turn them off sooner or later). Do you have any advice about headphones for toddlers and how to get them to wear them? I’d really like to be able to take advantage of audio/video books and DVD to keep her busy. Hi Kelly! I apologize for the slow delay in my response! I have been out of town. I do have some good ideas for headphones…I’ve actually been working on a post about that! I will finish it up and move up the timetable for that post so watch for it in the next couple of days. 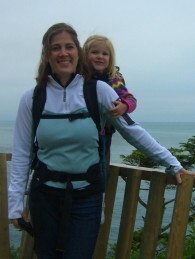 As for the other questions, my sister just did a guest post for this site in May that she talked extensively about carseats and strollers when taking long airplane rides. It is called “Happily Enduring Long Flights with Little Kids, Part 2.” I think that for such a long time traveling, and since your daughter won’t sleep on you, I would lean towards bringing the carseat. It would be a slight trouble, but worth it in the end. Thanks everyone for the info and thoughts….we leave for Scotland to visit family with my 10 yr old and 2yr8month old tomorrow, leaving at 8pm. My son NEVER sleeps on planes so after reading this post, I decided to bring his carseat. I needed a little convincing and this helped so much. Other trips were day trips and we went to the dollar store, bought tons of toys we could throw away and it worked great, night flights international are new…I’ll let you know how it goes! Any ideas on how to transition to the “sleep time” phase (other than books)? sorry…correction, 10 month old, she’s going to sleep in a skycot. 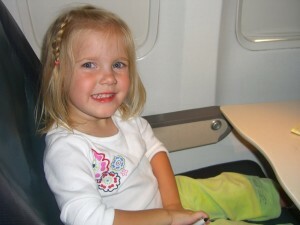 When my daughter was 18 months old we had the worst flight experiences possible – to and from St. Lucia. We tried to use the CARES system, but when she was in full blown tantrum she would slide down and get her throat caught on it. Miserable time for all on the plane! At two and half we flew again, this time with her car seat. It worked great! Because her seat is so familiar she was much more at ease. She also has a hard time falling asleep on planes but she was much more likely to nap in “her” seat. We recently got her a booster style seat and we are going to try that on the plane. Lower profile may mean we can use the tray. Finally, while the car seat has been a life saver, I would never bring it without the “Go Go Babyz Travelmate”. Easy to use and my daughter loves being wheeled through the airport in her car seat! Each child is different, but if you have had terrible flights in the past without the seat, I definately recommend giving it a try with the seat!